With breathtaking views of the Pacific Ocean, a UNESCO World Heritage site, exquisite palaces and churches with classic colonial architecture, and vibrant neighborhoods with eclectic art galleries and restaurants, a Lima tour through promises something for everybody. The capital of Peru and dubbed the city of kings, Lima today is a cosmopolitan hub best known for being among the top gastronomic destinations in the world. But, there’s also another undiscovered side to Lima, off-the-beaten-track, which bows graciously to its rich history, through the grand architecture of its former Spanish rulers, a myriad of ethnicities and re-imagined colonial neighborhoods. 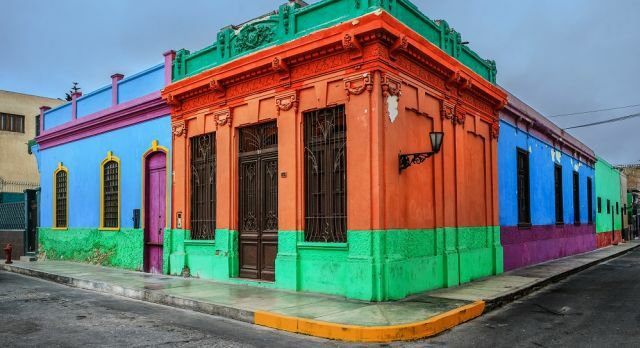 Take a Lima tour through its colorful neighborhoods and come face-to-face with friends of the aquatic kind and we promise, you’ll come back for more! Fancy a swim with some sea lions? 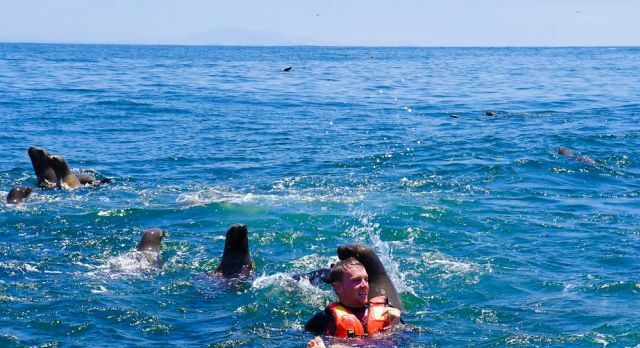 We doubt that your Lima tour checklist included a swim with sea lions but if that made you sit up from your chair, then you need to find your way to Palomino Islands, home to a colony of, according to local estimates, 8,000 sea lions! Leave the hustle and bustle of the city behind as you set sail from the harbor of El Callao onto the La Punta Sea, accompanied by a former naval officer. Curious and playful, expect some of the pups to come swimming right up to you making this a once-in-a-lifetime experience. Your boat/yacht will take you past San Lorenzo, Peru’s largest island and a militarized navy zone and on past El Fronton, dubbed Death Island due to it housing an offshore prison during the Spanish conquest. Head onwards to Cavinzas Island, where native seabirds rest and nest, before landing at the rugged and rocky outcrops of Palomino Islands. Without natural predators, this colony of sea lions has grown huge, creating a hilarious, honking spectacle on Palomino’s shores. If you dare to brave the chill, you will be offered the chance to gear up in a wetsuit and snorkel for the ultimate aquatic adventure as you swim with these loveable and delightfully amicable sea mammals. Curious and playful, expect some of the pups to come swimming right up to you making this a once-in-a-lifetime experience. Travel Tip – Maintain a no-touching policy with these adorable creatures. And don’t forget to take a water-proof camera to capture some Instagram worthy pics! If you are looking for a Lima tour that is filled with colorful and eclectic experiences, then you can’t afford to miss a trip to El Callao. Peru’s first port and home to a number of Lima’s most interesting attractions, including the historic Real Felipe Fortress and a couple of naval museums, El Callao underwent a dark transformation from its grand plazas and ornate facades into a world of gangland violence, crime, and poverty. In order to combat it, project Fugaz or Shooting Star was initiated, bringing in a positive influence through art and culture. Take a walk through Monumental Callao, a neighborhood that is peppered with colorful and bold murals, quirky art galleries and restaurants. Fast forward to today and you will find the result of project Fugaz eye-opening, as the streets come alive with music and dance, live events, graffiti workshops and more, symbolizing a new beginning for El Callao. Take a walk through Monumental Callao, a neighborhood that is peppered with colorful and bold murals, quirky art galleries and restaurants, accompanied by a local guide, who is also a former piraña or gang member, and witness first hand the transformation that art can bring about. Spend time at a micro-museum of pop-up art installations that highlight the stories and progress of Lima over the years. This unique experience is not to be missed! Travel tip – While El Callao is a great place to visit, with an experienced guide, during the day, it is best to avoid the neighborhood after sunset. 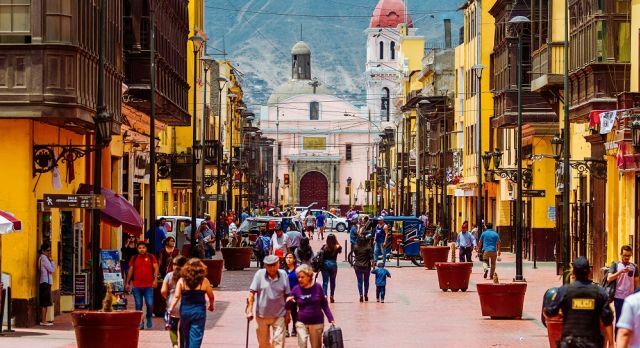 With a population that can trace back its roots to far-flung corners of the world, including Europe, Africa, and China, Lima is a veritable melting pot of sorts. Part of this diverse demographic is a 3,000 strong Jewish community that migrated from Spain, England, and Germany, among other countries, during the Inquisition. Take a tour through the Casa de Pilatos, one of the oldest houses in Lima and a magnificent example of colonial architecture. Go on a Jewish Heritage Tour with a historian and prominent member of the Jewish community who will act as your local expert and retrace the journey of the Jewish people all the way from the 16th century to modern-day Lima. Get insider access with our expert, who through their connections, will take you into the heart of the Lima’s active Jewish community. They will take you on a trip through the troubled past and bright future of Lima’s Jewish people as they walk you through lesser known streets and neighborhoods of Lima. Understand the background of immigration into the city before venturing to noteworthy synagogues, lively schools and meeting places, including a Kosher Jewish deli. The modern-day Jewish community appears far removed from the persecution and isolation they endured during the Spanish Inquisition in the 16th century, but you can relive the experience with your guide during a visit to the Inquisition Museum, a building that was witness to the persecution of Jews. Take a tour through the Casa de Pilatos, one of the oldest houses in Lima and a magnificent example of colonial architecture that was also used as a safe house and asylum for practicing Jews during the Inquisition. While at the Casa de Pilatos, don’t forget to click a picture in front of the monumental staircase, a rarity in Limeño architecture. One look at the impressive front and patio and you’ll know why this is one of Lima’s must-see attractions. Finish off this enriching tour of Lima’s little known Jewish heritage with a taste of Peruvian hospitality as your guide invites you into their family home for afternoon tea where you can enjoy an informal discussion about Jewish culture, history and present-day life for the Jewish community in Lima. Whether it is the undiscovered streets and islands or food you wish to feast on, a vacation to Peru is incomplete without Lima! Combine a tour of Lima with a trip to the iconic ruins of the Machu Picchu, a visit to the architecturally stunning Cusco, and breathtaking Puno by Lake Titicaca. Talk to one of our travel consultants and create the ultimate Peru vacation.